Evernote iPad app is the digital equivalent of a school notebook, so it’s easy to utilize in your classroom. Evernote notes you create on your school iPad can be accessed across all your devices at school, home, and on your mobile phone. Having tools that work on both mobile devices and computers is indispensable when you use your iPad while you’re out and about and then need to continue your work on a laptop or desktop. Evernote is a blend of digital notebook and all-purpose filing cabinet. You can use it to create and keep information or to store and organize all types of digital content. In fact, Evernote is so multidimensional that it’s difficult to pin down a simple description. Take notes, Type class notes, meeting notes, to-do lists, ideas, and more. Just set up notebooks in Evernote, and create notes as you need them. Take Evernote with you on your mobile device wherever you go, and use it to remember everything. Your notes will be waiting for you on your desktop or laptop when you sign in. Record audio. Notes don’t have to be text. Use the microphone on your iPad or mobile device to record audio in your notes. Record a lecture. Have students record themselves reading or speaking in a foreign language. Record a snippet of a song you want to remember. Record voice reminders. A picture is worth 1,000 words. Take and record photos with the iPad camera. Whether it’s the cover of a book you want to read or the whiteboard in your class, just open a new note, tap the camera icon, and snap your pic. Collect content from the web. Evernote can be used to archive webpages, images, or any other portion of a webpage. 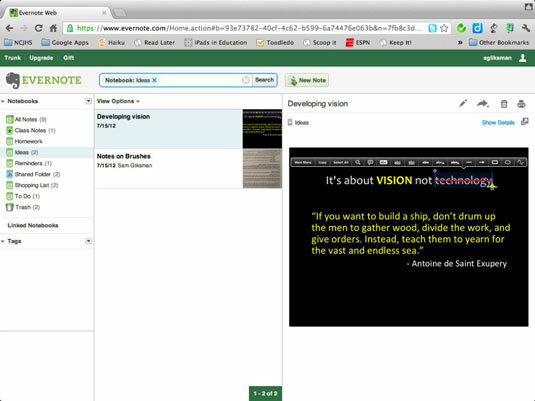 Using a tool called Evernote Clipper, you can cut out any portion of a page for archiving. Archive anything you can e-mail. You don’t need to have Evernote with you to archive your digital content. Every Evernote account has its own unique e-mail address. As long as you can e-mail anything, you can save it to your Evernote account. Students can submit digital assignments by simply emailing them to this special address. You can even tag incoming content in an email, in order to direct that content to a specific folder. Share. Share folders with others so that you can collaborate and access content together.